Chicago Bicycle Accident Lawyer | Illinois Bicycle Lawyers at Keating Law Offices: Should Illinois Enact "Idaho Stops" for Bicyclists? Should Illinois Enact "Idaho Stops" for Bicyclists? 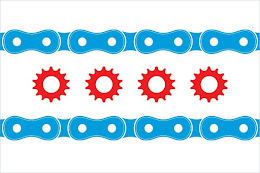 In an excellent submission to the Chicago Sun-Times, Willmette bicyclist Bill Jackson notes the differences in bicycle laws in Illinois and other states, namely California and Idaho. Mr. Jackson argues that more efficient traffic control regulations for bicycles would make bicycling safer and more accessible in Illinois. Idaho's bicycle laws are particularly unique in that they do not require bicyclists to come to a complete stop at a stop sign. In Idaho, a rider approaching a stop sign must only slow down and, if it can be done safely, proceed through the intersection. If there is another vehicle in the intersection, however, the bicyclists must stop and yield the right of way. A non-complete or rolling stop such as this is now known as an "Idaho stop." As for red lights, a bicyclist in Idaho must first stop at the light, but if the "coast is clear" and they can do so safely, the bicyclist may proceed through the intersection against the red light. Click here to read the text of Section 49-720 of the Idaho Motor Vehicle Statute. In Illinois, bicyclists are required to obey all traffic laws just like motor vehicles. This includes coming to a complete stop at stop signs and red lights. Even if there is a decent argument that "Idaho stops" on bicycles meet the spirit if not the letter of the law, the bottom line is that the law is the law and as of now bicyclists in Illinois are required to come to complete stops at stop signs and to obey red lights.